Ed: Long-time socionomist Murray Gunn is the Head of Technical Analysis for HSBC Bank. Gunn publishes macro level, technical analysis research for clients including fund managers, central banks and corporate treasurers as well as internal HSBC trading and sales operations. At the April 2013 Socionomics Summit, Gunn explained that comparing the relative strengths of sectors can uncover underlying social mood and foretell trend reversals. Socionomist Alan Hall reviews the main points of Gunn’s presentation. The black line in the top chart shows the US Consumer discretionary sector—companies that produce automobiles, consumer durables and apparel—bigger-ticket purchases that reflect confidence in future earnings. Plotted alongside it is the Consumer Staples sector, in red. These companies produce food, beverages, tobacco, household and personal products, purchases that reflect practicality and do not reflect confidence in future earnings. We can see that each sector follows the same general path in both bull and bear markets. But by looking at the ratio of relative strength, which is plotted in the bottom chart, we can easily gauge which sector is stronger at any point in time. 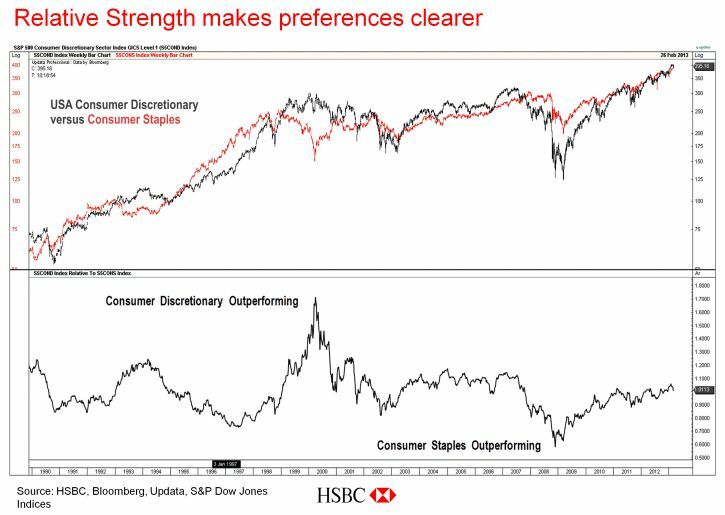 We can see clearly, for instance, that the run into the bull market high of 2000 was accompanied by huge outperformance in consumer discretionary goods versus staples as social mood reached a peak positive extreme. This is what we expect, because this ratio is measuring a sector that represents optimism and risk, i.e., consumer discretionary, against a sector that represents a more defensive psychology and stability, i.e., staples. As social mood declined into the 2009 low, the ratio of relative performance hit an extreme low, with staples showing strength versus consumer discretionary. Technical analysts amongst us, please note the divergences between the indices and the ratio at the 2000 high, the 2002 low, the 2007 high and the 2009 low. 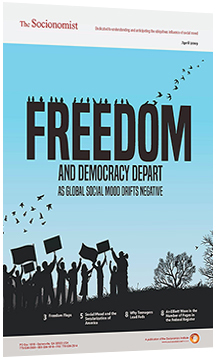 In each of these cases, we had an early warning that social mood was changing. How these sectors perform relative to each other can tell us a lot about the mood of the market. In the rest of this 6-page report, Alan Hall reviews four more comparisons that Gunn shared with Conference attendees, including the Sector Rotation Index and the Austerity Indicator. Read the remainder of the article to learn how you can apply these lessons to gain an advantange in the markets.